Selling your home can be expensive and stressful so you need to know you’ve got the right agent fighting your corner. 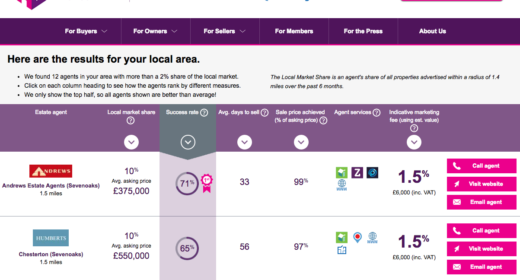 The HomeOwners Alliance new tool estateagent4me brings you a tool that allows you to compare local estate agents and find the best one for you. How do you identify the best local estate agent? Our complex statistical engine run by estateagent4me is fed on a daily basis with property data from over 18,000 estate agents across thousands of different websites to provide accurate comparison data. We currently cover over 95% of all property advertised for sale in England & Wales. See below for more details. Do you compare all UK estate agents? We currently compare estate agents in England and Wales and have plans to expand the service to include Scotland and Northern Ireland shortly. We currently have over 95% of estate agents represented on our comparison results. An estate agent covers my geographical area but is not showing on the comparison page? To appear in our comparison results an estate agent must have a minimum of 2% of the local market share in the area of your property postcode. Estate agents are ranked according to the data column you choose to sort by. The top 50% of agents are displayed in the column. Does it cost me anything to use estateagent4me to find an compare local agents? There’s no cost to use our website – it’s completely free with no obligation. Why do I have to tell you about my home when I start my search? Once you’ve entered your details we can show you the best agents in your local area. Will you pass my data on to estate agents? Yes, we collect personally identifying data at the outset which we pass to carefully selected third parties, including the estate agents listed on estateagent4me pages, so they can send you information or contact you by telephone directly which you may find useful regarding their products and services. We also add you to our mailing list to which we periodically send emails about new services or other information from the HomeOwners Alliance which we think you may find interesting using the email address which you have provided. You can unsubscribe to our mailings at any time. Will you pass my data onto anyone else? Yes we may share with our partners and carefully selected third parties. How likely an agent is to sell a home is determined by the percentage of all properties found advertised by this agent on websites during the last 180 days that were subsequently advertised as sold subject to contract. On the results page, we refer to this as their overall success rate. How quickly an agent will sell your home is determined by calculating each agents’ average time to reach sold subject to contract for all properties advertised by this agent on websites during the previous 180 days. On the results page we refer to this as average days to sell. We also show each agents track record in achieving asking price. To calculate this, the sold price (as recorded at HM Land Registry) is divided by the initial advertised asking price averaged for a representative sample of properties found advertised by this agent on websites during the previous 180 days. On the results page we refer to this as “Asking £ v Sale £”. And finally, we use market research to get an indication of the fee that each estate agent would typically charge for successfully selling a property. Our website is updated every day. Ready to find your local agent? Now that you know how it all works, why not compare estate agents where you live? Q: Is there a standard minimum contract term for all estate agents you show? Q: Are there any additional fees I have to pay? A: There’s no fee for using estateagent4me. Your chosen estate agent should tell you about the fees you’ll need to pay when marketing your property through them. estateagent4me shows the estate agency fee where we have it, but you should check with the agents you approach – and negotiate! A: There’s no fee for using estateagent4me and most agents don’t charge an upfront fee. If you don’t already have an Energy Performance Certificate (EPC) for your property, you may need to pay for this upfront. And online estate agents can ask for a fee up-front. Every agency is different so check. Q: When do I have to pay for the estate agent? A: Most estate agents will charge you a pre-agreed marketing fee on completion of your sale. Q: Do I have to pay anything if my sale doesn’t complete? Q: Can I instruct more than one estate agent? A: Yes. Through estateagent4me you can find, compare, contact and then go on to instruct multiple estate agents and request multiple property valuations. Some estate agents would also be willing to market your property jointly with one or more estate agents but you may pay more commission. Q: Is the fee you show guaranteed? A: No. The price we show is an indication of the typical fee an estate agent charges for selling a property. You can use the site to compare fees and negotiate the best fee with your chosen estate agent. A: This will depend on the estate agent you choose. You should talk to your chosen estate agent to establish what they intend to do and ensure it meets your expectations. Q: What if I sell my property to someone the estate agent did not introduce? A: You should check the contract with your estate agent carefully before you sign so you know what the implications are in case of this event. Q: How can I see which estate agent sells homes like mine? A: The estate agent profile column within our comparison table shows the average property price marketed by that estate agent. This gives you a guide to houses sold in a similar price range. Call or email and we’ll get back as quickly as possible!